The Miami Dolphins play at SunLife Stadium in Miami Gardens, Florida. The Dolphins home field has balmy 70 degree days throughout winter and is a great location to visit for a National Football League game. Look at the Miami Dolphins seating chart for a basic layout of the seating areas at SunLife Stadium and read through DolphinsSeatingChart.com for more detailed information on each of the available Dolphins ticket options. The Miami Dolphins SunLife Stadium is divided into multiple seating areas spread across all levels of the venue: Dolphins Premium Seating, Dolphins Ford Sideline Club, Dolphins Lower Prime, Dolphins Lower Sideline, Dolphins Lower Corner, Dolphins Lower Endzone, Dolphins TD Zone, Dolphins Upper Prime Loge, Dolphins Upper Prime, Dolphins Upper Sideline, Dolphins Upper Corner, Dolphins Upper Endzone, and Dolphins Phan Zone. The Dolphins use a pricing system which distinguishes between seats on home team (south) sideline and seats on the visiting team (north) sideline. Miami Dolphins tickets are largely sold through direct season ticket sales by the team and the SunLife Stadium ticket office, but tickets for individual games can be purchased through independent ticket websites and ticket brokers. Read through DolphinsSeatingChart.com for up-to-date information about the seating options at SunLife Stadium and see pictures from each of the seating areas before completing your Dolphins ticket purchase. SunLife Stadium has served as the home field for the Miami Dolphins since 1987. The facility has undergone multiple name changes including: Joe Robbie Stadium (1987–1996); Pro Player Park (1996); Pro Player Stadium (1996–2005); Dolphins Stadium (2005–2006); Dolphin Stadium (2006–2009); and Land Shark Stadium (2009–2010). SunLife Financial acquired the naming rights in 2010. SunLife Stadium was formerly used as the home for the Florida Marlins of Major League Baseball and the stadium still serves as the home field for the Miami Hurricanes NCAA football team. 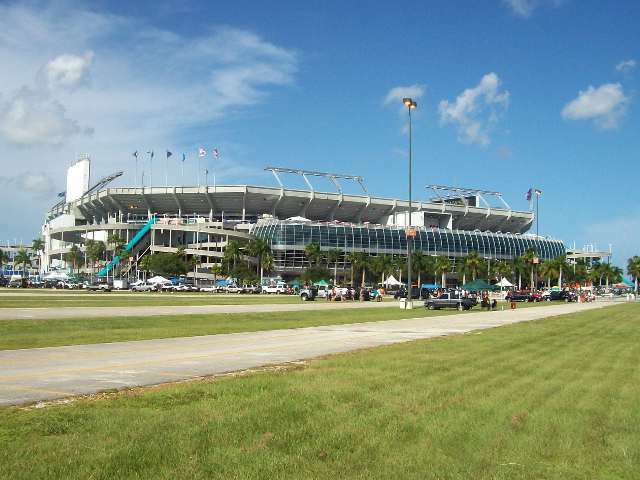 The Discover Orange Bowl is held at the stadium each year while prominent events such as the BCS National Championship Game and WWE’s Wrestlemania have also called SunLife Stadium home. The total capacity of SunLife Stadium is 75,192 for NFL football games with smaller maximum capacity for other events. See the SunLife Stadium seating chart for more details about the different seating options offered for Miami Dolphins home football games.